"I settled for dreams. I picked them off the floor and wiped them clean with my shirttail and tucked them into the pocket of my jeans. I made a pilgrimage - I walked, not rode - to Scooper Dooper and replayed the proxy, built the love bridge one last time. The last of the four cherries snagged on a sob in my throat at the table by the window. And I knew - I knew with a certainty ... "
I have been a huge fan of Jerry Spinelli's work since I read Maniac Magee in 1990! Maniac and others have a place in the Jerry Spinelli section on my 'keepers' shelves. If you haven't met his many memorable characters yet, I issue a challenge to change that during your summer vacation. The setting for Cammie's story is Two Mills, Pennsylvania (where we met Maniac Magee and his friends). The year is 1959. Mr. Spinelli provides a backdrop that speaks to my soul; a time when I was almost the same age as Cammie and experiencing the sights, sounds, and smells of my own community, with friends and without parents. She rides her bike for hours, without supervision or concern for her safety. The scenes at the prison add drama and demons. Quite an unusual and exceptional place to call home. Cammie's father is the warden at the Hancock County Prison. The two live in an apartment at the prison, cared for by one of the inmates, Eloda Pupko. Cammie is missing her mother who died when Cammie was a baby. Now, she is aching for someone to take her place ... another mother. She sets her sights on Eloda, believing that she can be that parent she so needs. Her loneliness and anger consume her. As she struggles to deal with the depression she is feeling, she is prone to outbursts and aggression. She finds solace in Boo Boo, a gregarious and affectionate shoplifter who takes the young girl under her wing during outdoor time spent in the prison's exercise yard. She is disgusted by her best friend's worship of an inmate charged with killing a teenager. Her scheming for Eloda to be her mother is not working. Convincingly, another awful loss puts her over the edge. How could someone so young possibly deal with it all? Cammie's voice is outstanding, while also heartbreaking. 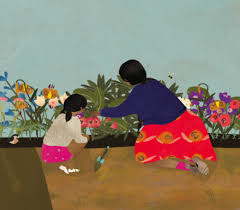 She begins the story in the present, and moves to the past: remembering its events, and; sharing her story with her granddaughter at the prison that has now become a birdhouse. She does not discount the stormy times experienced so many years ago. In the end, she returns her story to the present. "She's hopping in front of me. "And Ganny! Ganny! I nod. "Every one of them." The book is infused with heart, never dull and never preparing the reader for what comes next. It is devastating at times, and that is as it should be. Unforgettable! "The world needs childish thinking: bold ideas, wild creativity, and especially optimism," said Adora Svitak. She was twelve when she gave a lecture to adults about what they can learn from children. "Kids can be full of inspiring aspirations and hopeful thinking, like my wish that no child goes to be hungry." Janet Wilson has made it a mission to let her readers know about the many young people around the world who work diligently to make life better for others. Previously she has shared in two books: Our Rights (Second Story Press, 2013) and Our Earth (Second Story, 2010). In this book, she tells her audience about those who make a difference. I have shared this proverb before, but it bears repeating. you haven't slept in a closed room with a mosquito." Ten child heroes are honored on double page spreads. They come from the United States, Ghana, Canada, India, South Korea, Philippines, United Kingdom, and Japan. Their ages are mind-boggling. The youngest is 5, the oldest 16! They are each inspiring in their own right: for the ideas, the actions, and the successes they have achieved. They are young, full of kindness for others, and persistent in making things happen that make a difference in the lives of many. "There is no point for others to have so much to eat while others have nothing to eat." "No one should ever have to eat out of a dumpster." "Every kid deserves the chance to play." And it starts with helping one person." What an inspiration they are! Whose procession would you choose to walk in? We can all make a difference. A pleasing design, winning illustrations and photos, quotations from each of the 10 heroes and other inspirational leaders make this a book to be shared in classrooms and at home. Imagine the discussions that will follow. In follow-up pages, Ms. Wilson adds 22 information boxes about other children, their actions, their creativity, and a listing of those things we ALL can do: make the world better, help others, donate, volunteer, tell the world, fundraise, create or join an organization. sang along with his banjo. But it was getting colder. boat was no home for the bird. Covers are designed to draw readers into a book. This cover is a terrific example of how that happens. 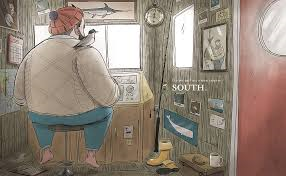 Before the story starts, it offers a clear look at the fisherman, his home and his much loved environment. Surrounded by birds and fish, and happily propelled through blue-green waters, he seems peaceful and content. It is not a large boat. It has all the amenities needed by the lonely fisherman who lives on it. When a single feather is blown onto its deck, the fisherman is surprised to find an injured bird beside it. He splints its broken wing, and together they wait for healing. They are happy together, sharing daily fishing adventure and food. Snowflakes swirl, and the two are worried for what is to come. Perhaps a new destination is needed. Ensuring that the bird is healed and in the right place, the fisherman says a sad goodbye. I have not yet seen other books illustrated by Daniel Duncan. I am impressed with his passion for detail. The outdoor scenes are filled with water, waves, birds and sea creatures. When he takes us inside, we can feel the warmth and hominess of his past and present life. There is much to see on every spread, leaving those who share the story with many observations and questions. What a character study he provides! Where is his HOME? And what is waiting there for him there? Daniel Duncan has left it to his readers to decide. Heartwarming and very sweet. Turns out a goldfish ghost can be born, upside down and floating on top of the water, when a pet goldfish dies. I certainly had never thought about our many dead goldfish and where their ghosts might have found a new home. Lemony Snicket has, and he shares those thoughts in this new book. It is a slyly humorous look at a pet's afterlife. While we may not think of ghosts being lonely, this one certainly is. His journey to find company is fraught with the inattention of others, and longing. After a time spent in the bowl, he determines that he will have to fend for himself in his search. Off he floats. 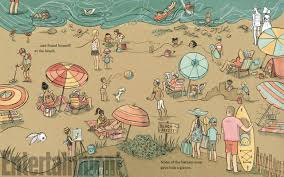 Through a seaside town, past the pier, to a main street busy with visitors and activity, to the beach where beach-goers have more to do than notice a ghostly presence, to the water itself where other ghosts are evident, though not welcoming. "It can be hard to find the company you are looking for." But, find someone he does and his life changes for the good. Has the death of a goldfish and its aftermath been considered previously in a picture book? I think not. Snicket's take on it is full of charm and comfort. Lisa Brown uses India ink and watercolors to add gentle humor and delightful details. 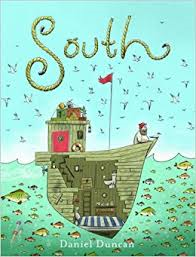 I love the setting she creates - a seaside town filled with vacationers bent on enjoying every moment spent there. The contrast from ghost world to that of the living adds depth of understanding. Please, please take time to let your children find all of the telling details! "It's only I," the littlest billy goat squeaked. "I'm heading up the hillside to make myself fat." "I'm going to gobble you up!" declared the troll. "Oh, no, don't eat me!" cried the littlest goat. "Wait until the next billy goat crosses. He's much bigger than me." Wait! There are two things I want to share before I tell you anything else about this newest book by the incomparable Jerry Pinkney. One: if you have never read one of his author's notes, please do so this time! He makes them so darned fascinating and thoughtful. They always give me pause. Two: If you want your kids to know what a troll really looks like, I cannot imagine a more accurate creature! Now, to the tale itself. 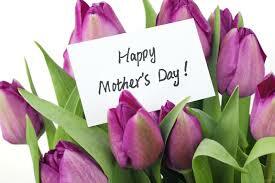 I am hoping that you know it, and that you have shared it with your kids. It is a trickster tale if they have ever heard one. Three members of a goat family can see that the grass truly is greener on the other side of the bridge. They are willing to take a chance with the menacing troll living under that bridge to satisfy their need for it. They know him to be heartless and cruel. The littlest goat is also the hungriest. He is old enough to read the BEWARE sign; he is also brave. His tiny hoofs capture the troll's attention, as we knew they would. He uses his size to allow a safe crossing. And, so it goes for the second troll. While the littlest trotted, the second troll stomps, is allowed to pass after some threatening bravado on the troll's part. Finally, he meets his match. The biggest goat storms the gate that offers a warning to those who dare to pass through it and onto the bridge. A fearful contest ensues. The troll is dislodged as is familiar to young readers. Then, Mr. Pinkney adds his own twist to the traditional tale - a less violent, and perhaps even more hopeful, conclusion. There is little to be said about his glorious artwork, except that it is glorious! 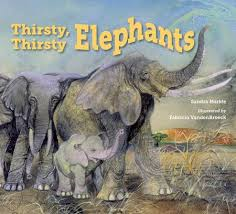 Children who cannot imagine being without life-sustaining water for themselves will clearly be very concerned for the herd of elephants described in this striking new book by noted author Sandra Markle. She chronicles their search for water during a time of severe drought on the savannah. In an author's note she tells her audience about an matriarch leader, Big Mama. In 1994 in Tanzania, a years long drought made finding any water virtually impossible. A researcher at the time was interested in Big Mama who had lived through two such droughts. One, as a calf, and the current one. He believed her memory of the first search helped her lead her family to a new source of water. Sandra Markle has a penchant for finding inspiration in real animals. So, we meet Grandma! She smells water and leads the way. Mother elephant follows with Little Calf in tow. Finding that first river offers some relief. Many other animals share what is there. The herd moves on, keeping close to the water even as its level drops. Soon, there is not enough for their needs. They must find water elsewhere. Lead on, Grandma. Fabricio VandenBroeck's stunning artwork is done in acrylics and watercolors. The illustrations allow readers an up close and personal trek alongside the elephant herd, almost tasting the dust and feeling the energy-zapping heat. The landscapes are as detailed as the elephants themselves. Little Calf, so cute and learning all the time, adds just the touch of humor needed to allay fears for the herd as it makes its way, finally to WATER. The author's note, further facts about elephants and a list of resources bring the book to a close. Where do your ideas come from? That is one of the first questions kids want answered when they have a chance to talk about the books they love with artists and writers they admire. I can just hear their questions after reading this extremely funny book for the first (and not the last) time. Two blobs - one is gray, one is brown - await their fate. They are slightly concerned, but also hopeful. A pair of hands painstakingly sculpts them into two brand new objects. A gray wolf and a brown owl now face one another, relieved that the work is done. That took a really long time. And it was SOOOOO boring. From then on, it is a constant contest between the two. Who can recreate themselves in the most astonishing way possible? It is quite the game they play, and will certainly hold the attention of readers and listeners as they go back and forth, their expressive googly eyes showing every emotion they are feeling. The funny business continues until footsteps are heard nearby, and the two realize they are about to be discovered. back! What should we do? The artist returns, squishes them back into shape, completes her planned work, and then returns the two to their original condition. Do you think they will be happy with that? The dialogue is spot on, and the sculptures give each character a terrific personality to match. Photographs of the artist's table provide the setting, and page panels help tell their story. Wonderful! And after lunch, those pictures take on a completely new look and meaning. 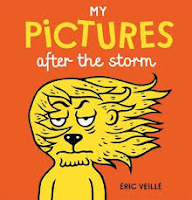 In this before and after look at variety in situations, Eric Veille draws cartoons on facing pages, meant to show the changes that can occur when something takes place. Before lunch, and after lunch. Before the baby and after the baby. Before the storm, and after the storm. Each view is full of fun and surprise and causes those sharing it to stop for a moment and take a closer look at what they are actually seeing. A storm wreaks chaos and even embarrassment. An elephant changes the landscape in mere seconds. Lunch occasions changes in what is meant to be part of it ... well, not for every single thing. A swim not only changes the child's demeanor, but results in a big mess of soggy togs. It looks like a book geared toward little ones. There is much more to consider here. The contrast from one page to another will cause readers to giggle, and think on what has caused the changes wrought. The language is rich and enlightening, the expressions droll, and the imagination extended to new heights. Your kids, no matter their ages, will want to share it again, and you won't mind that a bit. You will share many happy moments as you find new things to tickle your fancy each time you sit down to have another look. 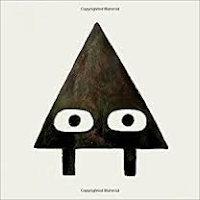 Mischievous and very clever, this is a book for the 'keepers' shelf. what I'm doing here in the dark. By myself. With all this stuff. Why? Well, it's a long story." It may be long. Louie's right about that. But, it's such fun to read. You will never feel the slightest inkling that it's too long. In fact, you will likely be sad when it's over. You will surely want to know more about Louie and his brand new life. Wait! I am getting ahead of myself. Louie wants to share his turmoil and troubles. So, let's give him the stage. 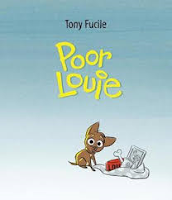 In a most winsome voice, Louie shares just exactly what has happened to get him to this place and time - and to his decision to run away from home. In the beginning, there is nothing wrong with his life. In fact, it's great. He is walked, adored, fed well, clothed, and pampered in every way. He doesn't even mind being a part of the friendly dates his mistress shares with others. Then, things begin to change dramatically. Those dates suddenly take on a new look. First, one baby. Then, more and more. Louie is the center of attention for their grabbing and pulling and squeezing. Luckily, they do eventually go home. Life returns to perfect. Until it isn't! Every day brings new changes, and a shopping spree. Louie begins to understand that two of everything cannot be good for his future. "One of those creatures I could handle. alone. Not even a kiss good-bye! together and ran away. Forever." Or does he? And should he? I am a big fan of Tony Fucile's pencil and watercolor artwork. He is able to convey such emotion on every page, changing perspectives and sharing humor that will have listeners (and readers) enjoying the total experience. Then, they will want to share it all over again ... and again! In their fourth book together, Helen Frost and Rick Lieder turn to the little ones - the young and awesome. It is a fabulous invitation to our own young ones to get outside and see what's there. The remarkable photographs and lively text encourage careful attention, and a whole lot of wonder! What an exploration they offer from the comfort of our chairs! Just imagine what else might be out there for our pleasure and observation. There are familiar babies here - and they are close enough that we can really concentrate on everything that is so special about them. If you get outside to see them, you will be adding the sounds, the smells, and the beauty of capturing nature through our own lenses and senses. 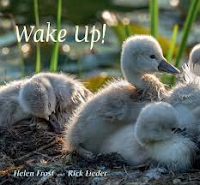 Mr. Lieder catches a tadpole as it ascends through water, a fawn in sunny repose, a cygnet finding its way into the world, a hungry baby bird awaiting sustenance. The sunlight and shadows cast are captured beautifully. Ah, spring ... you bring such marvels. For readers wanting just a bit more, end matter provides thumbnails of each glorious photograph and names their subject, with just a touch of added interest. dappled sunlight on a forest floor." safe and collect the honey. honey for the bees to eat." I thought this would be a valuable addition for today's post, as Gerald Kelley introduced hard-working bees in Benedict's story. In Amazing Bees (a beginning to read book) from DK, little ones will get the scoop on the work and wonder of being a bee. Bees are busy as you know ... and they play a very important role in the way the world of nature works. 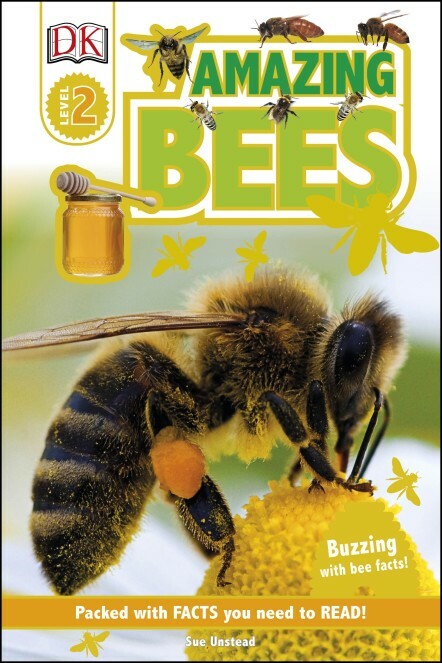 In brief, accessible text, readers learn what makes bees so special, what they are and their anatomy, their life cycle and the work that they do for us. of a teaspoon of honey in its lifetime. and only female bees have a stinger." And that is not all you will learn in this well-designed book, filled with pertinent information and colorful photographs. Now, you know the rest of the story. you! In the fur coat!" to talk!" said the bee. Oh, my! Benedict loves nothing more than honey. It is on his toast in the morning and in his tea at bedtime. He is one content bear when there is honey on the menu. He loves it when his days go from one familiar thing to the next. He is ill-prepared for a life-changing event. The bee explains that having Benedict's yard to live in is not enough. Their hive is a mess. "It's all we can do to keep the walls from falling in! The roof leaks. Winds blow through the cracks. of the lousy working conditions." And that is not all! The yard is overgrown with weeds, no flowers in sight. To strike is the only feasible result of the neglect. It gets Benedict to thinking on how he might help to make things better. He is a quick study and the results of his work are quite remarkable. The pace for the story is perfect for little ones, the characters are engaging, and the artwork is often funny, and full of emotion. 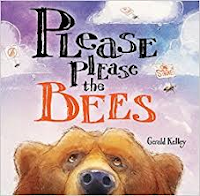 There is much for readers to see and to learn as they share this plea to please the bees! "Sundays are the hardest days since Mama Lacy died. I go to church with Mama Shannon and Zany and there's the loneliness of the empty seat next to us. No one's ever filled Mama Lacy's seat and everybody talks at us, but nobody really talks with us. They mean well, they just don't know us. We only went to church in the first place because Mama Lacy wanted us to, ... "
When Mama Lacy dies after a valiant fight with cancer, the family's life takes an even more tragic turn. First, Mama Shannon, Fella and Zany must leave Asheville where they have lived happily together. Moving back to West Virginia to be close to family and where state laws concerning gay marriage grant Fella's grandmother (Lacy's mother) custody of the younger sister, causes further sadness, tearing her away from the only family she has known. Mrs. Madison loves and cares for Fella, providing all she needs to live a comfortable life while Shannon and Zany struggle daily to make ends meet. It is only one of the issues faced. 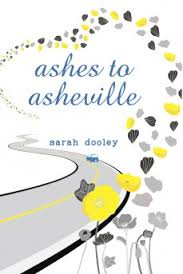 As Mama Lacy's fortieth birthday approaches, Zany wants to grant her dying wish and scatter her ashes in Asheville where the family had lived in peace and contentment. Fella, and her grandmother's dog Haberdashery, become unwilling participants for the middle-of-the-night trip. It is, to say the least, the longest night of their very young lives. A series of crazy and sometimes dangerous mishaps will have readers quickly turning pages, while also holding their collective breath as they travel with the two girls. 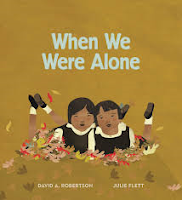 Fella's voice is so personal and strong in this first person narration of the turmoil faced, the memories shared, and the many changes that have followed the death of their mother. Fella's 12 year old self shines through, at times humorous to keep spirits up during their ill-fated trip. In the end, will Mrs. Madison and Mama Shannon be able to find common ground, and mend their broken hearts? Discussion is sure to follow concerning the true meaning of family, and if it should be left to lawmakers to decide what that is.. 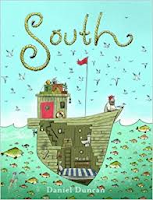 If you are a middle grade teacher, this would be a memorable story to share before your students go home for the summer. It is powerful, touching, and welcome. "Harriet calmly yawned and fell asleep. But in the morning, she was curious. What was she missing? Harriet decided to go out into the big world. She wanted to see the penguin parade on a neighboring island. It took place in the summer. 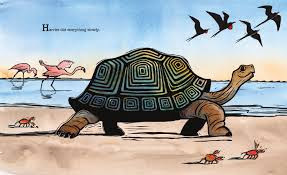 To get there on time, Harriet left in winter, the rainy season. She was in no hurry." Harriet lives on one of the islands of the Galapagos Archipelago. She moves slowly, to the beat of her own drummer and the rhythm of her heart. Creatures who share her habitat constantly chastise her life's pace, saying she needs to step it up to see what she has been missing. Luckily, Harriet pays little mind to their constant nattering. When her curiosity about the world gets the better of her, she sets out on a journey that begins with a desire to see the penguin parade on a neighboring island. She doesn't know it will take all winter to get there. The sights along the way are worthy of attention and admiration. Harriet is happy! After the parade is done, Harriet moves on to more exploration and many lovely discoveries. She spends days with new friends, helping where she can and observing all that is there for her to see. Her travels last for many months. Then, she is ready for home. Just as she is about to set foot on her home island again, a pod of high-spirited dolphins whisk her away in an attempt to show her how much fun speed can be! She is impressed, for a time. Ultimately, she decides that life in the fast lane is not for her - the strong wind causes her to close her eyes, the water swooshing past leaves a salty taste and nothing else. Worth a try, but speed is not for Harriet. Harriet's many memories offer lovely scenes and learning from her prolonged trek. But, nothing beats home. Once more, she is content. Laurel Molk's artwork depicts the setting beautifully. She uses block prints and watercolor, then digitally enhances the scenes to bring the islands and waters of the archipelago to life for her audience. I love the heavy dark lines that add dimension and vibrancy to the beauty found there. 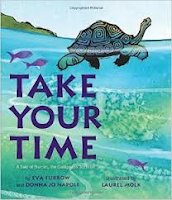 An author's note following the tale's text tells readers that Harriet is named for a very famous giant Galapagos tortoise who lived to be approximately 175 years old, and died in 2006 at Steve Irwin's Australia Zoo, the 'world's oldest animal in captivity'. We are reminded that the giant Galapagos tortoise has been hunted to near extinction. Probably. Yes. Of course he did. It's summer, ten years after their mother's death by lightning at the very same lake they have loved all their lives. The sisters are here again; this time, everything's different. Their summers have always been spent with their father and their lake friends. This year, their heavily pregnant stepmother is with them, and Abigail has transformed into a girl interested in boys - two of them! Abigail - now calling herself Abi - is thirteen and Claire, at 10, is not keen on the changes surrounding her. She would prefer that everything stay the same. Their story is told in three voices: Abi, Claire, and the lake. Helen Frost's ability to fashion brilliant family stories in poetic form is evident on every page. There is no scarcity of uncertainty; it is handled with care and compassion for both girls as they navigate the many challenges they face. 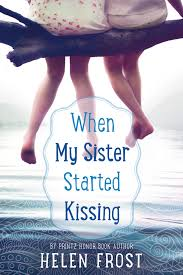 The lake's voice adds a sense of calm to the emotional upheaval felt by each sister. Growing up is hard. Everyone involved is coming to grips with this new family dynamic. The family as they have known it until now will never be the same. But, isn't that what happens for most families ? We grow and change. It is important that those changes be acknowledged and discussed. Helen Frost ably navigates the stormy waters from personal and powerful perspectives through her adept poetry. She manages to give authentic voice to each character, showing readers a willingness to explore their challenges. Using variety in poetic form for each voice, she builds authentic characters. It is a compelling story, told beautifully. ever head down that path, I won't be traveling blind." Notes on Form is advantageous, as is the addition of a list of favorite poems used for some included lines. oversized zest. Breathing one sky. Forever connected by this peculiar and wonderful family tree. Branches that soar, swim, stalk." What a collaboration this is! Take a renowned National Geographic photographer and pair him a Newbery Medal winning author ... what a gorgeous book they have produced. "I want people around the world to look these animals in the eye, and then fall in love with creatures as dazzling as a pheasant or as odd as an octopus. And once we love something, won't we do anything to save it?" "Speaking of poetry, this project resonated with me as a writer because of the parallel nature between powerful photographs and poetry as narrative - which is its own way a kind of literary snapshot. Both have the ability to bypass the skin and enter through the heart ... "
Together, they match perfectly chosen words with stunning close-up images of endangered or threatened creatures to give clarity to the plight of the world's animals. 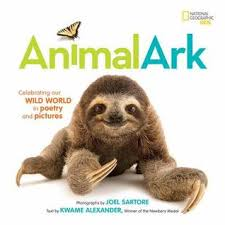 The black and white backgrounds, the similar size for each animal, due to astute photography, give readers a sense that each is equally important. There are three gatefolds - the first one is at the beginning of the book and labels the animals pictured and adds the code used to describe their risk of extinction; the second opens in the middle with another group, also labeled and coded, and includes a plea to readers to take notice and do what needs to be done to help preserve their numbers; finally at the back, the third names each of the creatures included with accompanying poetry, their code and where they can be found in our world. "There are too few remaining. because of you and me." "It wasn't quite what Charlotte had in mind, but she tried to remain positive. The rock, after all, was a good listener. It was also quiet and easy to train. And it was hypoallergenic, which was good ... "
Charlotte isn't particular about the kind of pet she gets. She simply knows she wants one. On her sixth birthday her parents surprise her with a ... pet rock! They are ecstatic. Charlotte not so much, if a picture is worth a thousand words. Charlotte is clearly not a complainer. She accepts her pet rock with grace, and is able to admire its many attributes. There are difficulties. Walking is not an easy pursuit. The teacher has a very difficult time accepting its role in the case of the missing homework, as you can imagine! But, being ever optimistic, Charlotte is impressed with what they can do together. There is only one obstacle to enduring friendship. Dennis shows no emotion for his owner. No matter the circumstance, Dennis is impassive. Until one day ... insomnia? Or something else? What a shocker! Her family remains positive, a lesson well learned by Charlotte. This is a great deal of fun to read aloud in a classroom. Kids will love the expressionless voice, the sudden surprise and Charlotte herself. The artwork is created with nib pen and ink before digital coloring. Its many details add context and humor, while also presenting a worthy protagonist whose emotions are evident on every page. 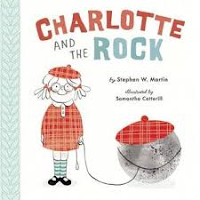 Please don't miss Charlotte's Pet Rock Rules, if you are seriously considering a new family pet! "For most of the seventeenth and eighteenth centuries, natural was the last thing the lords and ladies at the French court wanted to be. They covered their hair with wigs that were sometimes a foot high and hid their skin under oils, rouge, and powder. They wore unwashable brocades (rich silks with raised patterns), velvets, and satins that had permanent sweat stains ..."
Annick Press does such a terrific job of publishing nonfiction that pulls readers in, and gives them information that they didn't know they wanted to know. This book is presented in nine chapters with appealing illustrations and plenty of 'yuk' moments. That's when kids are bound to share what they are reading in order to see the reaction of their friends. "Keeping your body clean is healthy. practice is important for your health. end of this book to find out what it is." I know you will be tempted to page ahead and discover the answer right now. But if you do that, you will miss out on a lot of fun and many fascinating facts shared. Try to dampen down your curiosity. Reaching back into history, the author provides her audience with a chronological view of past centuries, beginning each new chapter with a story about a child of the time meant to connect them with the experiences of modern readers. Many influences are presented ... religion, setting, class, progressive (or not) thinking, and even advertising. 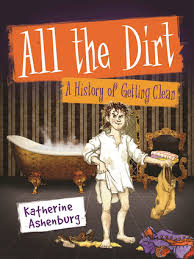 Bringing it to present day, Ms. Ashenburg offers a look at our obsession for using antibacterial products at every turn. The sidebars add important, and often entertaining, facts and encourage further interest. Accessible and most enjoyable, this is a book that will encourage some readers to do their own research to see what else they might discover. Hmmm! Worth some research, don't you think? One lesson I learned is that some of the dope on cleanliness needs 'cleaning up!'. Here's the book to get it started. Oh, and the answer to Myth #7? I won't reveal that secret. I will give you a hint. Do you have 20 seconds? "We were NOT prepared for how many times a day our baby would need a diaper change. How many so far? Three? For all those new moms out there on Mother's Day 2017, here's a book that might help your older kids and others learn the ropes. The young narrators have experience; they want to share what they have learned with the kids who will read this book. It is valuable advice. "A new baby's coming your way? We got one of those! not as hard as it seems. We were GREAT at it right away. As they grow accustomed to her presence, Anna and Oliver make many funny observations about her. The sounds she makes, including SPLORT! which leads to the need for a new diaper. Parents are pleased to have help with that. They ask about and can then explain the umbilical cord, the things babies can and cannot do, the visits and gifts, and what siblings can do while everyone 'oohs' and 'aahs' over the tiny bundle. Holding the baby must be orchestrated, and might just result in a bit of a mess. Oh, well. 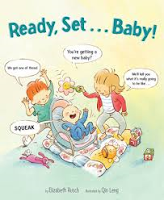 Filled with confidence-giving advice, and wonderful cartoon drawings that make plain their days, this book reassures anyone harboring a worry about what to do when the new baby arrives. It is a charmer, adding websites and tips that are beneficial and positive. "Maybe it was all that pressure to be perfect, to be the next DiMaggio. Mickey called his pa and told him he wanted to quit. His pa drove up to Kansas City - but it wasn't to give his son a pep talk. "I thought I raised a man," he said. "You ain't nothin' but a coward. Get your clothes and let's go home. You come and work with me in the mines." Baseball season is in high gear! Mickey Mantle is one the players I heard much about when I was in my teens. Although I was not a Yankees fan, one could not help but be wowed by his many accomplishments! They still talk about him. Jonah Winter certainly proves himself a big sports fan with this new addition to his long list of picture book biographies honoring some of the most iconic players in league history. Mickey Mantle's story is laid bare in his fine new book. One of the greatest hitters in baseball (and THE greatest switch-hitter of all time), Mickey's road to super star status was marred by a sad and life-altering childhood. It would impact him for the rest of his life. Readers learn that in an author's note that prefaces the title page. It was Mickey's father who decided that he would be a ball player. He wanted a better life for his son than the one he was leading in the mines. His apprenticeship began when he was still in diapers. Every day was spent playing ball with his father and grandfather. They taught him to switch hit; his family rooster taught him to run! Mickey did not seem destined to be a star player. Often sick, it wasn't until he was fifteen that he finally hit his stride. "By junior year, the kid was unrecognizable - bulging muscles, legs like tree trunks. Girls wanted to date him. Boys wanted to BE him. What did Mickey want? Nothing much - just to be the greatest ballplayer who every lived." He wanted to take Joe DiMaggio's place in the Yankee lineup. He soon signed with their system and played for two years in the minors. He began to make a name for himself while there. And, the rest is history. Mr. Winter continues the story, through successes and down times. A serious knee injury, the death of his father, and a return to glory due to determination and grit, won him accolades from every front. Though never perfect, he was certainly someone to watch - and fans did so at every game he played. 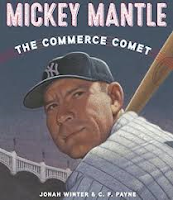 Engaging storytelling and focused acrylic and pencil images bring The Mick to life for readers who may have only heard stories about him, and who never saw him play. His career is not diminished in any way by those facts. This is a worthy and honorable look at a sports hero. "But sometimes in the fall, when we were alone, and the leaves had turned to their warm autumn hues, we would roll around on the ground. We would pile the leaves over the clothes they had given us, and we would be colorful again. And this made us happy. "Now," Nolom said, "I always were the most beautiful colors." I was in Winnipeg last week for a visit with Bret and to take my friend Carolyn to the airport for her return to Toronto. We stopped at McNally Robinson for a delicious lunch, and for a bit of a book look. My purchase was this beautiful book, and I want to share it with you. Thankfully, one of the recommendations from The Truth and Reconciliation Commission suggested the history of the residential school system needed to be taught in our schools, as early as kindergarten. There is not much literature for teachers to use when making that introduction for young children. For David A. Robertson, it was just the push he needed to write a book that will add to their choices. "Nokom, why do you wear so many colours?" I asked. Nokom said, "Well, Nosisim ... "
Nokom's explanation is equally honest, allowing her granddaughter a chance to begin to understand a time in the grandmother's life that was not happy for the most part. However, the answers she gives are gentle and repetitive always ending with a memory of a time 'when we were alone'. In those alone times, away from the eyes of teachers and others, Nokom could be happy again. "But sometimes in the winter, when we were alone, and we were sure that nobody could see us, we would find each other. We would take off our mitts, and in the crisp, cold are we would hold hands so we could be with each other. And this made us happy." Through questioning, the child learns how Nokom celebrates the important things in her life - her colors, her hair, her Cree language, and her much loved family. Young children will begin to understand the loneliness felt, the resilience of the grandmother, and her pride in her culture. The question and answer format is perfect for the age group; it is how they learn about their world. 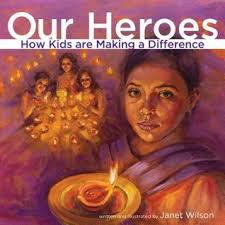 It is also a book to be shared with older students for the emotions it evokes and the discussion it will spark. 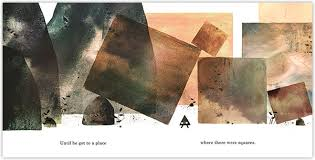 Julie Flett's beautiful collage artwork is simple, yet telling. I love the earth tones, the gentle smiles, the natural settings, the contrast between colour-filled and bare bones images. They impact the telling and give context to the feelings. "My most treasured possession is actually this humble collection of books. They contain tales of lands and creatures long forgotten, as told by the people who collected these amazing objects - my ancestors! They include such adventures as ... ... Eleanor Brownstone's discovery of the Crystal Kingdom and her subsequent death-defying escape." "But before all that, there was the first adventure a Brownstone ever had. This is the tale of Arthur, the unlikeliest of heroes." The young boy was always different. He loved the odd creatures in the forest where he liked to spend his days. He loved to listen to Atrix (the wise woman) tell stories that upped his thirst for adventure. As he ventured forth, he carried with him some of his prized possessions - a feather, a magic staff, the Hand of Time, and this journal. While searching for a magical worm, he is terrified by a howling and the rapid movement of a 'monstrous black wolf'. The wolf manages to put out the Icelandic village fire while being threatened by many townsfolk. And then it just disappears! The future for the villagers is dire - no heat, no hope for a future beyond one week. "Across the sea lies the land of the Viking gods. In a mighty hall on top of a mountain, there lives a god with a hammer that can command the skies. He alone has the power to relight our fire." Kids who have been to the movies in recent times might just recognize Thor as the likely helper god. Everyone in town is suffering from their fight with Fenrir, the son of Loki. Only Arthur is unharmed, and some townsfolk are blaming him for the wolf's visit. With his useful possessions in hand, he sets off to find Thor, who sends him on a quest to capture the beast. He will need two special ingredients. It's a long and treacherous journey, but the results are just what a hero story demands. This is the first in the Brownstone's Mythical Collection series, and we can only hope there will be more. It is the debut work for this fine artist and we are lucky to enter the Norse world of gods and adventure through his rich illustrations. The wordless panels, the clear storytelling, the fascinating world of Norse myth will surely attract the attention of many, who will then highly anticipate another family adventure. It's a promise, don't you think? "And that is the tale of the very first Brownstone. Maybe one day you will hear more of my ancestors' adventures, but until then, dear reader, I hope you go out and find some of your own ... because sometimes the greatest heroes are the unlikeliest." "Even though Bearland was very different and they would miss the Island of Coney, Mr. and Mrs. Loo felt so fortunate to be able to come and make a new home in Bearland. But Chee-Kee felt like he might never feel at home. He wanted to be just like everyone else. But he couldn't help noticing ... "
I have been sharing other stories of immigrants and refugees in earlier posts. Today, I have an immigration story with a bearish bent. 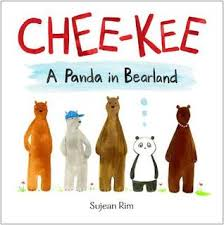 Chee-Kee has just arrived in Bearland, and is not feeling much at home. It is a story from author Sujean Rim's family history. Her parents immigrated to the United States from South Korea, and must surely have suffered the doubts and challenges of a new reality. "They moved around a bit for various job opportunities, and without another Korean soul in sight, they had a lot to learn on their own. My parents not only looked different and hardly spoke English, but they came with an entirely different set of traditions. ", the author pens in her author's note at the back of the book. The Bearland bears are mostly kind and helpful. Chee-Kee is quick to notice that he is different and is unsure of his place in this new land. He uses chopsticks, wears a sun hat, flies a rectangular kite. It is overwhelming. His parents seem less concerned, wanting to become accustomed to their change of circumstance. They make light of the changes they are facing, using humor to turn aside any insulting remarks. Chee-Kee's adjustment is not so easy. He makes sure that he is often alone. Then one day a soccer ball gets caught in a tree. It is up to Chee-Kee to fashion a solution ... and he does! It is a most interesting way to get the ball down. He is a hero, and finds acceptance among his peers. Ms. Rim uses mixed media to create the very appealing and revealing artwork for her newest book. The bears' world is wonderfully crafted, as are her ursine characters. Differences are evident, but charming. The story will surely encourage discussion about being different, about attitudes toward immigrants, and feelings of empathy toward those who are new to our communities. "This is how I go to school. Matt Lamothe is a traveler! He has made many discoveries in this world, recognizing that the lives we live are different. In this new and brilliant book, he helps his readers understand those differences while also helping them see that we have much in common. We are who we are, we live where we live, we have families (if we are lucky), we wear clothing when we go to school, we eat breakfast, we travel to school in a variety of ways, and so on through each day. I love that the kids he introduces are real. He enlisted families from seven countries to trust that he would bring their stories to an audience. 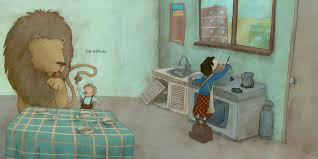 His conversations with the families give his readers a chance to experience daily lives in many parts of the world, while learning about diverse cultures. It is so necessary for our kids today to know and appreciate that. His book is filled with windows and mirrors that allow readers to see their own and other experiences within its pages. It's just a lovely way to learn. "We looked for families who have lived in the same country for generations. They follow many of the traditions unique to where they are from, but that doesn't mean the millions of people who call those same countries home have exactly the same tastes and experiences. Not everyone in Peru likes to play soccer, and not everyone in Japan eats fish for breakfast, in the same way you and your friends may have to do different chores, and may wear different clothes." "I believe the more you learn about different people, the more you see yourself in them, and the more accepting you become. 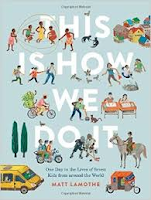 The more I thought about this, the more I wanted to compare and contrast moments in the lives of children from around the world." And, at the end of the day, we all see the same night sky! 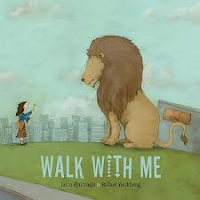 As the two - child and lion - take a walk home together, we learn much about the child's family, and the urban landscape that is her home. The child's invitation, by offering a bright yellow flower, provides her with company on a long walk that often makes her sleepy. The lion helps to make the time more quickly. A stop allows the child to pick up a baby sibling from day care. They are off to her neighborhood and to the store that is unwilling to give the family credit for their needed groceries. As she prepares the meal and waits for her mother's return, the lion is invited to stay. Once Mama arrives, the lion is left to its own devices and the family makes the most of what they have. Again, this is a perfect book to share first without any illustrations to let children imagine what is happening. It is not until they have a chance to see the brilliant and detailed illustrations that they really begin to know the environment that surrounds this joyful child as she navigates the end of each of her days. The city is smog-filled, dull, busy, and a trifle dangerous. The neighborhood is warmer, although more rundown, and their house has what is needed. The reactions to the lion are great fun, and the final image gives pause to think a little longer. Emotionally memorable, and full of compassion, please take the time to focus on the details, consider the circumstances and wonder at the talented artists who bring this story so beautifully to life. to tell such a story. in my story ... "
Why on earth does Macy's mother thinks she needs to get married? Why must they sell their house? Now that sixth grade is soon over, things should be looking up. Instead, Macy's mother is going to marry Alan which means Macy is also acquiring six-year-old twins as stepsisters. Can things get worse? Apparently, they can. Mr. Tanaka, her teacher, is very excited about a final assigned project dealing with genealogy. He wants his students to research their family and make a presentation to the class. Macy's family is very small - Mom, Uncle Caleb, Gran and Grampa. The assignment precipitates a big fight with her best friend, Olivia. she knows the most sign language. It's enough to send Macy into a fit of anger. Before she knows it, she has alienated that friend and finds herself facing detention for her actions. As if that isn't quite enough, she soon discovers that her mother has offered her services in helping their neighbor pack up her many books as she prepares to move into assisted living. Iris is 86, and doesn't know any sign language. Between the two, they fashion a way to communicate through beautiful notes and a mutual love of books. Both are lonely and in need of a friend. Their developing relationship is very special. Macy's first person narration makes it so real and immediate. We feel all that she is feeling as she comes to terms with the many changes in her life. Their written conversations (in personal journals) pass back and forth as needed. Their notes concerning the books they love are lively and quite lovely. This verse novel is admirable. 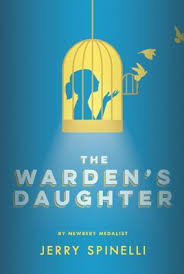 Its wonderful characters, memorable plot, perfectly chosen language and form, familiar settings, unwelcome changes and humor offer readers a very personal look at a young girl struggling to find her way. She does it with the help of family and friends. 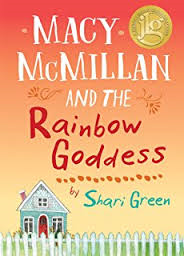 The stories, notes and cookies that Macy shares with her 'rainbow goddess' leads to a very unexpected friendship - and the heart of this very special book. Want to see a trick?" Two very special friends are back in the limelight again. 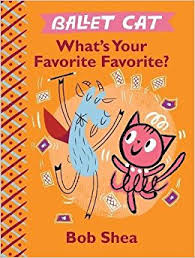 Ballet Cat and Goat both have impressing Grandma in mind when they decide that they will dazzle her with a special showing of their formidable talents. Ballet Cat has been considering her many wondrous moves. Should she twirl, leap, jump? How should be put such brilliant moves together for a splendid show? Her ballet show will be most impressive. Goat is not on hand to see her fancy footwork. Rather, he is preparing a show of his own - magic. Both are sure that Grandma will be most impressed, as each is convinced that what they are doing is sure to be Grandma's favorite. Ballet Cat knows both to be favorites of hers. Goat will not be deterred. He is quite convinced that today's magic with be her FAVORITE favorite. Ballet Cat is a tad put off, until she can't stand to miss the magic. Goat's magic does leave something to be desired. He asks to see the ballet, and is quick to realize that Ballet Cat is very good at what she does. The stakes get higher. Finally, it's time for the show! They carefully prepare Grandma for the promised entertainment. Grandma's response is classic! Once she is awake again, and facing pressure to choose 'the best', she has the most perfect idea. It serves as an ideal solution to the dilemma. Kids who love this series of adventures will only love it more when they come to the end. Surely, we will meet them again soon! Spring is in the air ... and those who love fishing will be anxious to spent their days at shorelines trying their luck at catching something delicious for supper, or just for sport. 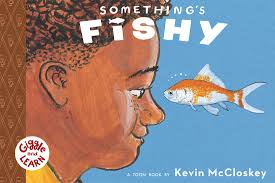 For kids who don't know much about fish beyond an occasional meal or a pet goldfish, Kevin McCloskey is here to change all that! In another wonderfully informative and carefully designed book from Toon, he has his readers look at fish big and small. In fact, he begins with a fish alphabet, introducing one fish for every letter. I found a number were new to me. Following that, we begin our attendance at 'fish school' where we find there is much to learn. Our guides are two young children, who have an abundance of knowledge about their subject. A parrot serves as a check on the information being shared, and a cat and dog are attendees along with the reader. that means they have bones. is a fish with no spine!" Just as he did in We Dig Worms! and The Real Poop on Pigeons!, Mr. McCloskey provides a useful overview of the species: how and where they live, and what makes them so special. Finally, turning our attention to the goldfish, he expands our knowledge of what is often favored as a pet. He says that is as it should be. Still, there are things we need to know about them. They swim to the people who feed them. History and biology are important to the book, as are the realistic drawings that fill its pages. 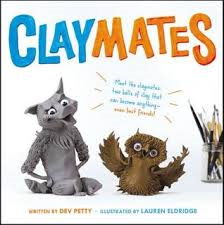 Cartoon-like, brightly colored and engaging, this is a terrific way for young readers to learn about science. Just look at that cover, and tell me you haven't been eager to read another book by this formidable team. When Mac Barnett and Jon Klassen put their heads together, you know you are going to love the results. After Extra Yarn (Harper, 2012) and Sam and Dave Dig a Hole (Candlewick, 2014), you cannot help but highly anticipate their next collaboration. They do NOT disappoint! We meet Triangle first. He lives in a triangular world, in a house that is a triangle with a triangle for a door. The triangles are different sizes, and some have changed over time. His friend, Square, lives in a square-shaped world, similar to Triangle's but for that pervading shape. As he heads away from his house one day we learn that he has plans to play a 'sneaky trick' on his friend. His journey is long. His plan is in place. Triangle knows his friend well, aware that Square is terrified of snakes. So, he stands outside his door and HISSES! As expected, Square is frightened until he realizes that Triangle is playing a trick. The chase is on! All the way to Triangle's house where Square accidentally finds himself stuck in the triangular entrance. That accident sets a fear of its own in Triangle. Square quickly responds that his sneaky plan is now complete. The reader is left to answer the question: " But do you really believe him?" So much mischief and fun! Those eyes! They are brilliant. You will be sharing this often, and can bask in the knowledge that this is just the first book in a planned trilogy. Huzzah! "But then she thought about the falcon, how it was made to do what it did and had no choice in the matter. It was eat pigeon (of sparrow or rat or raccoon) or die, and Kid supposed that the beauty of the falcon was directly related to its ability to kill, a completely different kind of beauty than the beauty of the pigeon, and that humans' ability to recognize the two beauties ... "
Having grown up in Toronto and then moving to New York City for a few months, Kid is aware that she may have some preconceived notions about this new development in her life. I am here to tell you that nothing could have prepared her for the many discoveries she makes when the family takes up residence in an 11th story Manhattan apartment. The first, and most unsettling, question concerns the goat that is deemed to live on the roof of the building. Can that be true? Kid really wants to know. The events that unfold on her way to learning the truth are at the heart of this wonderfully unique story about community, love, loss, fears, pets and family. Her parents have agreed to care for a dog belonging to her father's cousin. The kid is named Kid, the dog is named Cat (actually Catherine the Great) and the fun doesn't end here. Kid's parents have reason to appreciate the time spent in New York. Her father has taken time from his teaching to work on his writing, her mother is preparing for a role in an off-Broadway production. Kid, shy at heart, is soon welcomed to the building by everyone there who knows Cat. 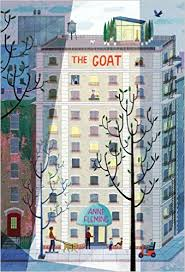 Will, a boy who lives in the building with his grandmother, is the one who tells her about the goat. As they go searching for proof of its existence, they meet the others who live there. We, as readers, learn their stories and come to appreciate the true meaning of community. 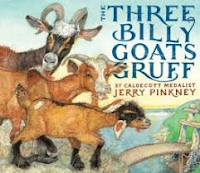 Through a funny third person narration we learn that the goat has a story, too. While Kid and Will are the main characters, we become familiar with each of the other characters in uncanny and interesting interactions. Only a very skilled writer could create a stirring story using an absurd premise and keep it from being overwhelming for her readers. Each of the people we meet have something to conquer, especially Will and Kid. They seem to bring out the best in one another, gently encouraging facing those things that threaten to overwhelm them. Together they work with the others in the building at solving the mystery of the goat's presence, always assisting through their own strong storyline. In the end, with humor and a perfect sense of timing, the mystery is solved and readers are left with a feeling of contentment and delight. The New York City scenes are described beautifully, the characters are memorable, the wordplay is perfect, and the story is a wonderful blend of joy, sadness, intrigue and hope for all concerned. I think you should read it. It is a book I will read again, for love of the writing itself and for better recall of every action it so skillfully describes. I am left to wonder what this fine debut author has in store for her young readers. "Most people do things together all the time. Like Mr. Buvard and his friends. Or the Berman brothers. Or Mrs. Brock and her knitting club. Or Ana-Marie and her friends. But me - I'm what you call a loner. I do stuff all by myself, and it doesn't bother me one bit. Just the opposite ... I love doing things by myself, but I love climbing my tree best of all." Having helped raise an introvert, I love to read stories that honor who they are and how they feel. Jacques Goldstyn seems to know them well. His Bertolt captures the essence of a child who is introverted and seems not to mind at all. Can there be a better place to be than that? This unnamed boy tells his story with acceptance and acknowledgement that he knows himself, and is not too concerned that others do not. that doesn't match. Who cares. different mittens is kind of funny." He does have one especially favorite pastime. He loves climbing an old oak he has named Bertolt. Because it is cold in the throes of winter, he likes to imagine that spring will soon change Bertolt's bare branches into 'the coolest hideout ever'. He is the only one who climbs the old oak. "The first branch must be 15 feet from the ground. and where to put my hands and feet. It's like climbing up a secret ladder." And who doesn't love secrets ... and being alone ... and feeling at home? In fact, he is never alone on Bertolt's branches. There are all manner of birds and other creatures for company. All of his imaginings for spring spent in those branches come to a crashing halt when he realizes that Bertolt is not leafing out and must be dead. What can he do before Bertolt is turned into 'firewood, or furniture, or toothpicks'? Ink and colored pencils are used to create the moving and often humorous images. Sweet, but not too sweet, this lovely book honors the quiet, introspective kids born into our families, who are part of our classrooms and communities, who take pleasure from being alone, from playing outside, and from making a special friend of a tree whose branches sustain and protect. The wordless forays are worthy of careful contemplation. The artwork is simply stunning. Please find a copy for yourself and share it with others. It was a perfect day for Dog." Bert is the boy in charge of making everything ideal for the animals in his care. On a warm and sunny day, Cat finds a bed of daffodils that provides comfort and beauty. Dog is delighted with the cool water being hosed into the wading pool where he can laze on such a day as this. After he fills the feeder with birdseed, Chickadee is a delighted visitor. Since that feeder is not accessible for squirrel as it protects Chickadee's nourishment, Bert drops a corncob onto the grass for the wily and disgruntled rodent. It is a perfect day for each one of them! When Bear lumbers forth into their territory, the scene undergoes a marked change. 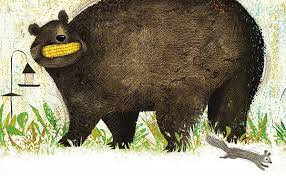 Now, it is Bear filling the double page spread, a corn cob looking like a new set of dentures in his large maw. The grammar changes. Today was a good day for Squirrel. And so it goes until Bear has managed to scuttle the day for each of the aforementioned creatures. Chickadee's feeder is emptied. Dog's pool provides a cooling off from the warmth of the summer sun. Cat's daffodil patch becomes the perfect place for Bear to create a 'summer angel', not unlike the winter ones that kids so love. Suddenly, the perfection of the day is lost to all but one. You know who is having a perfect day now, right? 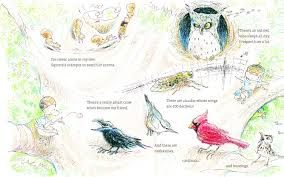 The mixed media illustrations are signature Lane Smith! He works with texture and scale in line and warm colors, and offers much for his readers to contemplate. There are so many places where I just wanted to reach out and touch the images, believing that I might be able to feel what I was seeing. Wouldn't that be sweet? 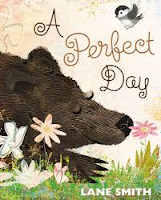 Lane Smith based the idea for this book on a series of visits made to his schoolhouse studio by a bear who likes to see what was in the feeder just outside Lane's window.